Eh.......... I wouldn't say that. I just mean... seeing what he goes through... the trauma he's been through... I don't see why he mightn't have lost his memories another time before. Given the fact that he's been in AC for like 4 months in terms of when the LNs started telling some of his daily adventures... and he was presumably with the same type of personality before he could go to a heaven's Canceller after each battle arc. I would be surprised if there was a photo of Touma and Misaki while they were young if they really were childhood friends. Well what happened to her after that incident. She had to go somewhere right? I wouldn't be surprised if she went to Touma in the meantime before she had to go to Tokiwadai... or it could have happened before that project first occurred. Does her ability works against a magician with God's Right Seat Divine Punishiment? It's kind of hard to aim without any bad feeling towards the target. We can't tell if her Mental Out really works on mages. Are you sure he was in AC for 4 months before the beginning of Index/Railgun? Well, she was in AC at a very young age. But it's unclear if Touma was in AC at that time as well, so as Seria (since she became one of the board directors of AC). Touma enters academy city after prep-school so his in academy city since grade 1 or elementary. Though I don't know about Misaki. The flashback in chapter 59 has shown that Misaki was in AC at a young age, but not sure when precisely. Elementary? 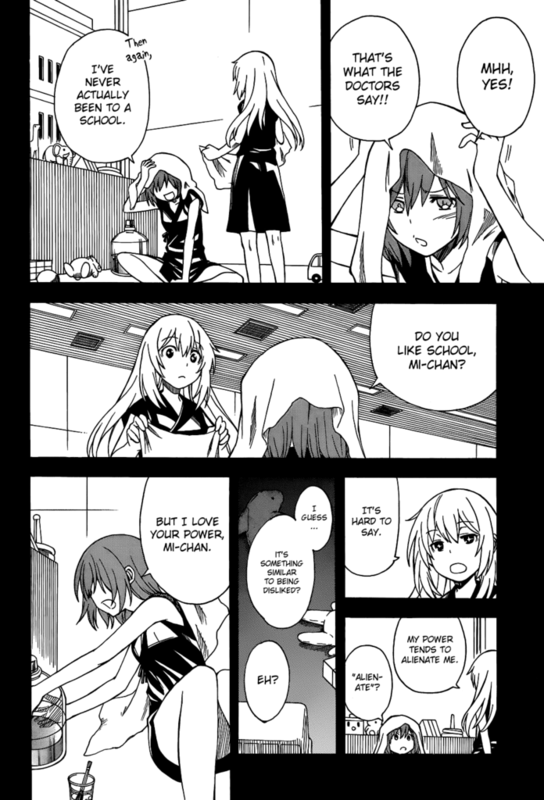 Maybe middle school, Touma was on AC at that time already(see vol.4). OK, I'm a bit confused here. Touma was in AC since elementary or middle school? He moved to AC about the time he was on elementary school due to the massive bullying. Thanks for clarification. Being moved out to AC due to his mass-contribution of misfortunes around him, eh? If Misaki moved into AC in middle school, then it couldn't be right since she was already there when she was a kid. In that case... then it could probably support the theory that Misaki may have met Touma (along with Seria) around the childhood times. At most would be late-childhood/adolescent time if childhood period is not viable. I keep saying it times and times again, but people, stop involving Seria since there's basically nothing supporting a childhood friend route involving her. With Misaki as a childhood friend, doubtful but plausible. With Seria as a second childhood friend, despite proof of the contrary, it's a fantasy. Last edited by allfictions; 2013-09-12 at 05:28. ^ Logic says no until proved otherwise. Remember how Misaki says how she was alienated before? So how did she become more confident with her powers and actually start to attract servants/friends? Like example Misaki is alone or something back in Elementary School, then Touma approaches her and tries to befriend her and tells her that he tends to get alienated too somewhat because of his misfortune and such. Like, maybe have this happen after the Dolly incident maybe. LOL! Almost sounds like Touma moved into AC for the same reason. Misaki, on the other hand, did that mean she moved into AC shortly after she newly-found her Mental Out? ...that is the proper form for our relationship ability. No matter how many times I ask or our paths cross, the answer is always the same. Saying this will probably make you angry just like back then, but perhaps that is my punishment for having this power. I'm against the fact that she is his childhood friend, not that they were friends, big difference. If you want to talk about Seria, just think of Endymion's retcon. I think it was more like she used to use her power to tell when somebody was lying or something like that. So obviously the people would dislike her and would try to keep themselves away from her so their secrets don't get found out. Later she would just control them as she does now. Everyone is pretty interested in finding a romantic bond between Misaki and Touma. Am I the only one who's only interested in the posibility of Misaki befriending Mikoto in the future?